A Derry woman has spoken of her shock at finding the confidential patient notes of two strangers within her own medical records. Cathy Malcolm received her records from the Western Trust in July last year. She said discovering other people's names, hospital numbers and contact details within her records had horrified her. The Western Trust said it has taken action after investigating the incident. Ms Malcolm told BBC Radio Foyle she discovered the information of the first patient as she read through her file. "As I was reading the notes it hit me half way down that this was not me. There was quite sensitive information about this particular person," she said. She contacted the trust to return the notes but soon discovered information relating to another patient. "It was the same scenario, I was reading through my notes and discovering that this wasn't me. I was in complete and utter shock. " she said. "The thing that surprised me in the case of finding person two was the way it was presented. "It was basically an A4 sheet with my information on one half and the other person's on the second half," she added. The notes were returned but Ms Malcolm said her trust has been broken and that she didn't get the support she needed. She said the incident had left her feeling "violated in some way." "As much as I was struggling with how I was feeling all I could think about was these two poor people." She said wondering if her notes had been shared with anyone caused her "massive anxiety" and had requested emotional support in relation to the incident. "I am satisfied from the perspective that the trust has done its investigation and are making changes," she said. "But the missing piece of the jigsaw is that I had asked for support when it happened last July." 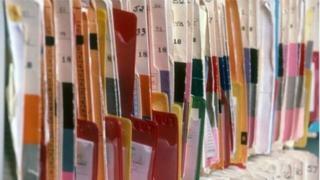 A spokesperson for the Western Trust said the confidentiality of patient records is extremely important to the trust. "With the Trust's Incident Reporting policy this has been fully investigated and remedial action taken," the spokesperson added.